Production technics: pipe joint is made by silica sol casting process. Why we choose silica sol casting process to produce the pipe joint? 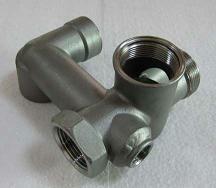 That's because pipe joint made from stainless steel is with higher quality and also long time corrosion resistance. And we usually produce the stainless steel castings in the way of Silica Sol Casting. Pipe joints made by silica sol casting are with higher accuracy on dimensions, thus, there're no requirement for machining or little machining job required. The surface of the pipe joints made by silica sol casting process, thereafter mirror or finish polished, is very smooth and shiny, which show a good impression and beautify vision for pipe joints, especially those assembled visibly. Materials: The usually used material of the pipe joint made in our silica sol casting factory are as below. Application: the pipe joint made by silica sol castings process are widely used in the pipeline industry.The pipe joint used as joint or connectors to assemble pipe components together. With help of such joints, the road of the piping can be as complex as what we need. With the accuracy and surface smoothness made by silica sol casting process, the pipe joint can be assembled well. Production Standard: silica sol cast pipe joint can be made according to different standard, such as GB/T12459-2005,GB/T13401-2005,ASME B16.9,SH3408,SH3409-96,SH3410-96,HG/T21635,DL/T 695,SY/T 0510,DIN 2615.